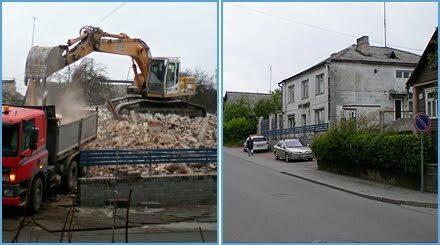 (ISJM) One line and a few pictures in a Lithuanian online news service reported the demolition of the former community synagogue in the northern Lithuanian town of Anykščiai (Aniksht in Yiddish). The reason given for the demolition of the building on Saltupio Steet, which had been used as a bakery, was a "state of emergency." A new building to house a social services center is planned for the site. In the one picture posted of the standing building it does not appear to have had any surviving identifying or distinctive exterior features, though it looked to be in relatively good condition. You can read about the Jewish history of the town here. Newark, NJ. Wells Cathedral, former Congregation Oheb Shalom. William Lehman, architect 1910-1911. Photos: Samuel D. Gruber (2006). (ISJM) I've previously written about the centennial of the classical-style Temple Concord in Syracuse, dedicated in September 1911. Another impressive (Greco-Roman) Temple-like synagogue building celebrating its centennial this year is the former Oheb Shalom in Newark, New Jersey, designed by Jewish architect William Lehman (1874-1951) and dedicated on September 11, 2011. 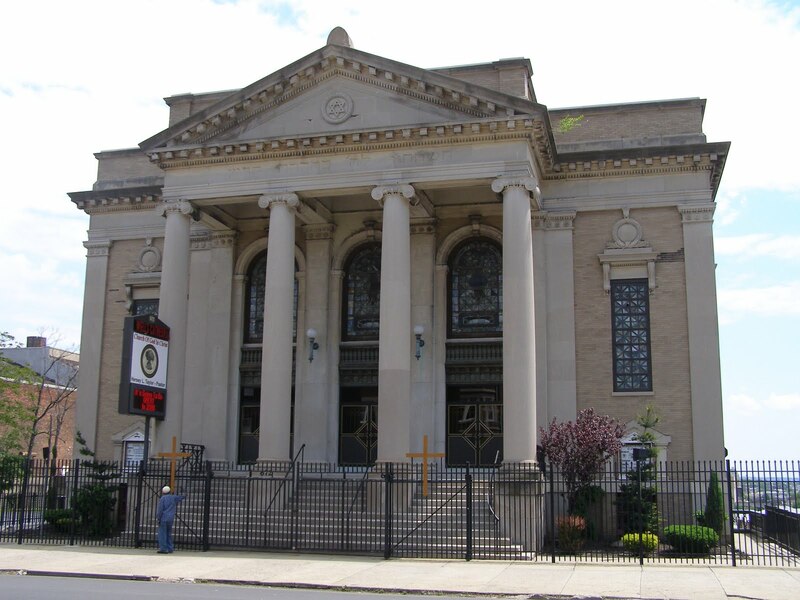 Since 1958, when Oheb Shalom moved to suburban South Orange, the High Street building has been home to Wells Cathedral, a Pentecostal church. The building is a an impressive structure with a fine projecting portico of four Ionic columns, and some delicate decoration, including a Jewish Star within a wreath set into the pediment. The entablature carries an inscription in Hebrew, not English an indication that this was a Conservative synagogue, not a Reform. My guess is that this is one of the earliest full-blown classical-style Conservatives synagogues. But then again, most Conservative synagogues did not engage in big building campaigns until after World War I, so Oheb Shalom was prescient in many ways. According to synagogue historian Mark Gordon, "Oheb Shalom had three locations on one block of Prince Street (rented quarters; 1863-64 frame synagogue; 1884 brick synagogue) before it moved to High Street in 1911. Woodrow Wilson was the keynote speaker at the High Street dedication. During Oheb Shalom’s 150th anniversary celebration in 2010, the congregation visited its extant Prince Street (1884) and High Street (1910-11) edifices in Newark and held an interfaith service with the Pentecostal Church which now owns the High Street building. 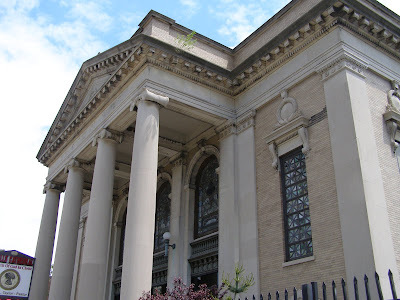 Several older congregants who participated in the service were quite moved to be standing at the original reading table where they became b’nai mitzvah." 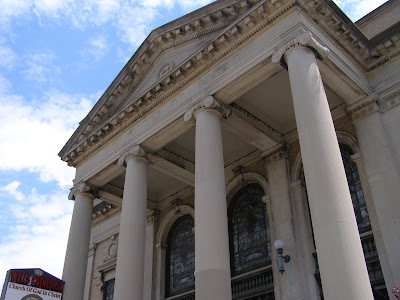 Photos of the building interior can be seen here, together with views of other former synagogues in Newark. Lehman was apparently Jewish. David Kaufman also has several pages on the 1911 Oheb Shalom in his book on the Jewish Center movement Shul with a Pool. 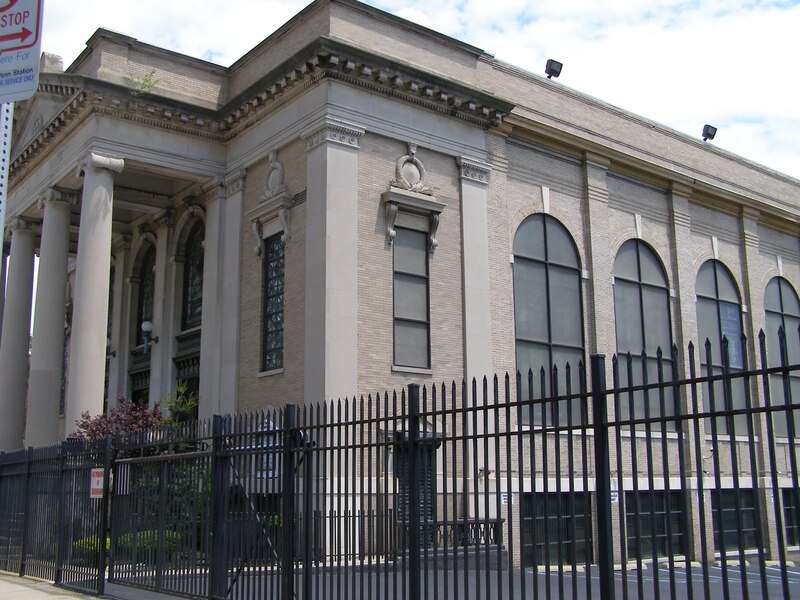 Lehman's New York Times obituary records that he was a trustee of B'nai Jeshurun in Newark, but Oheb Shalom is his only Jewish project that I've been able to identify so far. He appears to have been quite successful in Newark, and designed a lot of movie theaters and some important public buildings. There was/is quite a family dynasty, but one of the Lehman architects are listed in the Who's Who in American Jewry volumes of 1926, 1938-39 or 1972 The New Jersey Historical Society has 5,000 Lehman items in its archive. It appears that nothing significant has been written about Lehman, so his life and work could be a nice M.A. thesis. 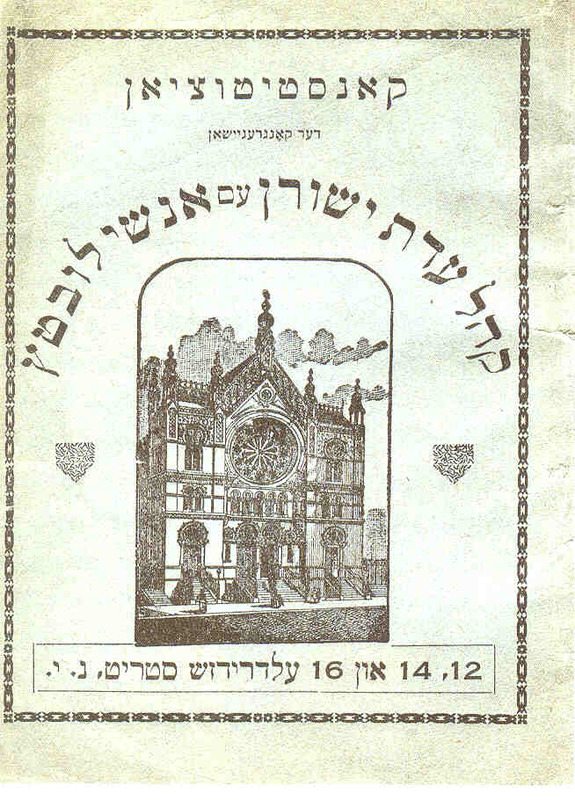 Papers of Congregation Oheb Shalom that may relate to the construction of the 1910-11 building are housed at the Jewish Theological Seminary. (ISJM) The international exhibition Forgive Us, Forgive Us O You Dead. 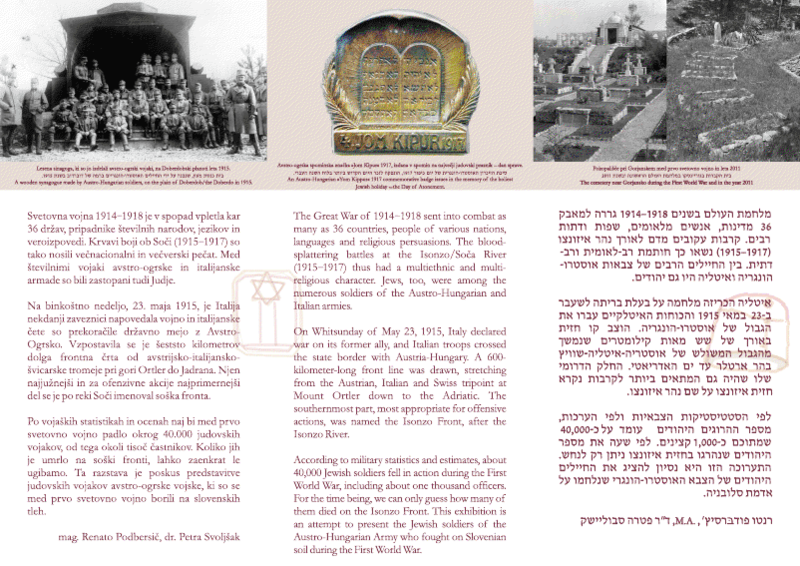 Jewish Soldiers of the Austria-Hungarian Army On The Isonzo Front will open tomorrow, Thursday, 17th November 2011 in the Maribor Synagogue, Slovenia. 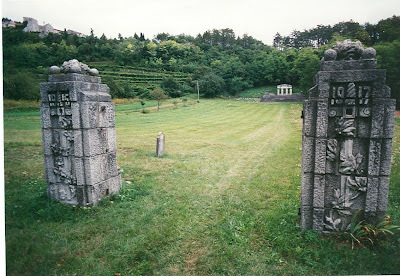 The exhibition theme is part of the ongoing dissertation research by Renato Podbersič, and continues preliminary on-site research begun by my sister Ruth Ellen Gruber, which was published as part of our survey of Jewish Cemeteries, Synagogues and Monuments in Slovenia of about a decade ago. The authors of the exhibition are dr. Petra Svoljšak, Head of the Milko Kos Historical Institute of the Scientific Research Centre of the Slovenian Academy of Sciences and Arts, and mag. Renato Podbersič, senior researcher at the SCNR (Slovenian Centre for National Reconciliation). Maribor, Slovenia. Panel form the exhibition. Photo courtesy of Janez Premk. Maribor Curator Janez Premk helped with advice and additional material, as did our good friend Ivan Čerešnješ, who provided historical photos of his grandfather and other Jewish soldiers from Bosnia, fighting in the Isonzo front. Doctor Premk believes the exhibition, which consists of 16 tri-lingual (Slovenian, English, Hebrew) panels, accompanied by rich graphic material and historical documents, is one of the major contributions in contemporary research of the Jewish past in Slovenia and adjacent territories. The exhibit will travel in Slovenia and plans are being made to then send it abroad. Despite opposition, the last remaining Jewish hospital building in London’s East End will be torn down to make way for a five-story housing development. The Tower Hamlets council agreed for the Jewish Maternity Hospital on Underwood Road, Whitechapel, to be demolished because it does not have landmark status. It is neither listed by English Heritage, nor does it fall within a Conservation Area, according to a report in the East London Advertiser. Those opposed to the demolition, including cultural and political leaders, are especially upset that the cottages next door to the hospital are also set to be taken down. They say that they are large single-family homes in good shape. “The Director of Jewish Heritage UK, Sharman Kadish, also wrote to Peabody [the real estate developer], saying the social and historic significance of the cottages next to the main hospital building have been overlooked while urging the trust to convert the cottages into residential use,” the article in the Advertiser said. The developer contends that keeping the cottages would negatively affect the number of housing units needed to be built and would make its plan financially unfeasible. The Jewish Maternity Hospital operated between 1911 and 1947 and had an attached midwifery school. It was built as a two-story building containing three maternity wards, an operating theater and several annexes and offices. Of its 12 beds, 4 were reserved for patients who could not pay for medical care. The building quickly became too small, and eventually additional wings were added on. The hospital also added on many other services, including pre-natal and post-natal care clinics. Since WWII, and after the hospital moved to another site, the building has served as a nursery and childcare center, and more recently as a family welfare association for local residents in Tower Hamlets. I often tell my clients to let no anniversary go unnoticed - each is an opportunity to stage an event and to raise attention and money. Few know this lesson better than the folks at the Museum at Eldridge Street. They know how to celebrate and after all they have achieved, they have every right to do so. Jews have so many commemorative events for catastrophes suffered and crises just barely averted. So it's nice to celebrate occasions where oppressors are not involved. 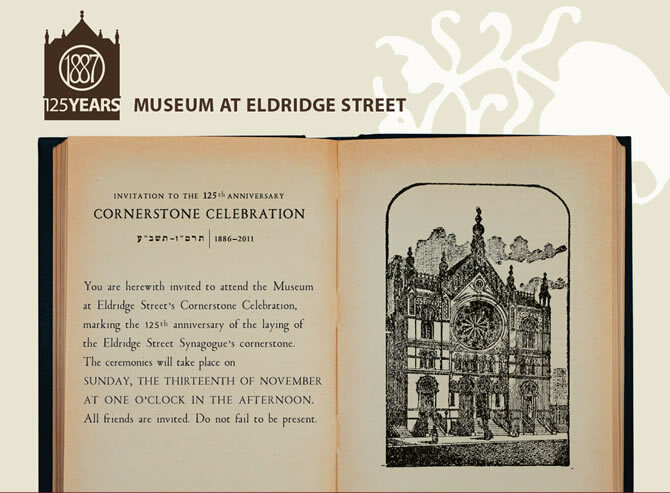 Next Sunday (November 13th) celebrate the 125th anniversary of the laying of the cornerstone of New York City's Eldridge Street Synagogue, for an event modeled on cornerstone celebrations of a century ago. I'm not sure if I'll be able to make it from Syracuse, but I'm going to try. Help create a living time capsule, with remarks and performances by: Rabbi Joseph Telushkin, Frank London’s All Star Klezmer Brass Band, Vocalist Jeremiah Lockwood, National Yiddish Theatre Folksbiene, Speaker Sheldon Silver and other Government Officials and Museum Leaders. 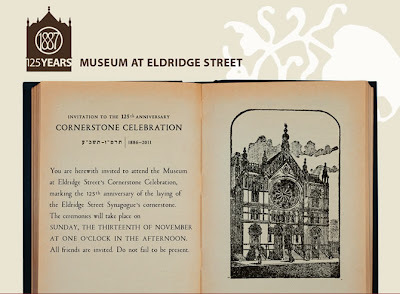 For more or my posts about the history, architecture and restoration of the Eldridge Street Synagogue type "Eldridge" in the blog searchbox. Update (Nov 17, 2011). You can read about the event and see a video in the Forward (online). The site is very rich in descriptive, historic and analytic content and photos of Cochin and Kerala's many synagogues. There is also an extensive bibliography. In the architecture Jay Waronker writes at length about seven standing synagogues as well as lost synagogues of Kerala. Many of my readers may also be interested in following the blog Jews of Cochin maintained by Bala Menon. Bala's most recent posting is about the Judaica of Cochin Jews which is increasing turning up in notably collections, and also at Judaica auctions. Meanwhile, the government in Kerala (India) is nearing completion on the careful restoration of the former synagogue in Parur. ISJM's Jay Waronker has been advising on this work for well over a year with support from the Koret Foundation. Jay will supply a report on the project's progress soon. Museums and collectors worldwide have been quietly acquiring valuable belongings of the Cochin Jews over the past couple of decades. Articles of interest include clothing, religious pieces, life-cycle related materials, historical and literary items etc., which all come under the general definition of Cochin Judaica. Some of the pieces are valued at several thousands of dollars. Many of these wonderful pieces are now appearing on auction sites like eBay, while some have become part of treasured collections at institutions like the fabled Magnes Collection of Jewish Art and Life at the Bancroft Library, University of California, Berkeley, the Skirball Cultural Centre in Los Angeles, the Jewish Studies collections at Columbia University Libraries, University of Cambridge and the Israel Museum in Jerusalem. Read the entire essay and see photos here. Jodensavanne, Suriname. Local residents have been trained in restoration techniques. Photo collage courtesy of the Jodensavanne Foundation (2011). (ISJM) Harrold A. Sijlbing - Chairman of the Jodensavanne Foundation writes to International Survey of Jewish Monuments that the "Foundation has realized an important goal in preserving the national Jewish heritage in Suriname" in the completion of restoration of four historic grave monuments in the Jewish cemetery and the remnants of the 1685 Beracha VeSalom synagogue. Jodensavanne, Suriname. 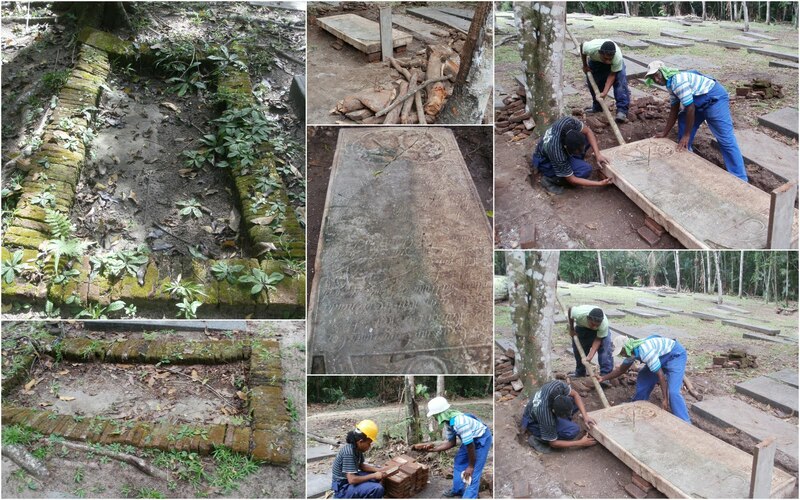 The process of restoring graves in the cemetery. Photo collage courtesy of the Jodensavanne Foundation (2011). 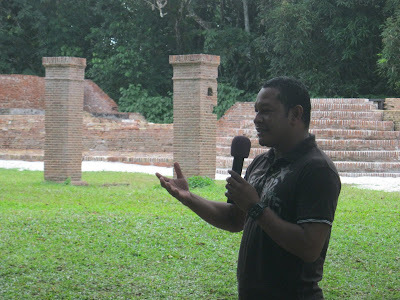 According to Sijbing, "the project was carried out by REMAS, a Surinamese construction company specialized in historic restoration, under KDV’s leading architect Phiillip Dikland and funded by the Embassy of the Netherlands as part of the “shared heritage” program." 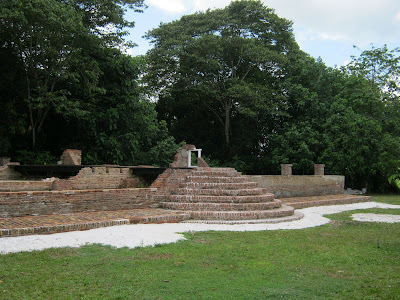 Jodensavanne is located on the Suriname River, about thirty kilometers from Paramaribo (also the site of synagogues and Jewish cemeteries). The settlement, one of the oldest Jewish settlements in the Western Hemisphere, was surrounded by Sephardi Jewish owned sugar plantations. After its abandonment, it was overrun by jungle vegetation. According to the Foundation's website, "the local indigenous community of mixed Arowak and Carib background, living in the village of Redi Doti, is co-manager of the monumental sites that are located in their ancestral territories. They fully contribute to the protection of the monuments and manage the buffer zones." 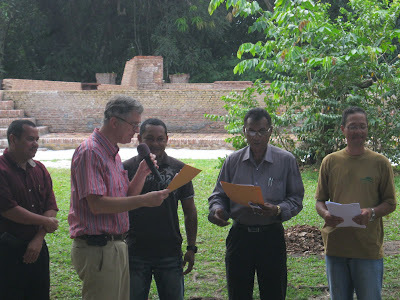 A ceremony marking the completion of this phase of work took place this past September 13 (2011). In attendance were the Foundation board, the Redi Doti village council, representatives of the Ministry of ATM, the Dutch Embassy and construction workers. Jodensavanne, Suriname. Above: Redi Doti village chief Lesley Artist speaks at the restoration celebration. Below: Mr. Petri of the Dutch embassy hands out certificates of appreciation. Photo courtesy of the Jodensavanne Foundation (2011). The use of historically correct mortars and materials was an important aspect of the project in order to secure the original design integrity. A special element of the completion ceremony was the certification of four young villagers of the neighboring indigenous settlement of Redi Doti, who were trained by historic masonry specialist Henry Lo Kioen Shioe of SAO. The Foundation has plans for a number of projects in the near future including the publication of a Jodensavanne Guide Book and the improvement in the training of local guides. The central subject in this action plan is to finalize the World Heritage Site nomination to be submitted to the UNESCO World Heritage Committee by end of the year. Jodensavanne, Suriname. The conserved synagogue ruins. Photo courtesy of the Jodensavanne Foundation (2011). 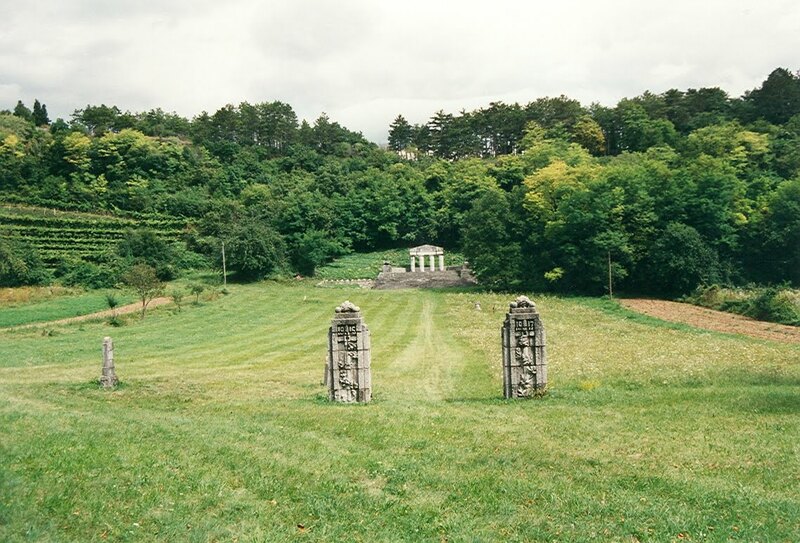 Beginning the 1995s, American architect Rachel Frankel began studying the remains of Jodensavanne leading to the continuing development of conservation, interpretation and presentation programs for the site. In the late 1990s the entire complex was placed on the World Monuments Fund Watch List, and gradually local organizations have rallied to the preservation and presentation of the site. Largely as a result of Frankel's work and the WMF listing, the Stichting Jodensavanne, Jodensavanne Foundation (JSF), which had been founded in 1971 was re-activated in 1998 and was granted the legal rights by the Government of Suriname to manage the monumental property. • build awareness and understanding; encourage appreciation, education and promotion, and facilitate access to the cultural heritage, in order to be a unique and enjoyable experience to all. For more on the site and recent research see my previous post: Publication: "Monumental" Book about Suriname Jewish Cemeteries., and the Jodensavanne Foundation website. Forbidden Art is the title of a new exhibition at the Auschwitz-Birkenau Memorial and Museum Memorial on view until November 20, 2011 on the grounds of the former Auschwitz I camp in the camp laundry building. The exhibition features photographic reproductions of twenty works of art made illegally and under the threat of death by prisoners in German Nazi concentration camps. The photographs are accompanied by commentary and excerpts from archival accounts. 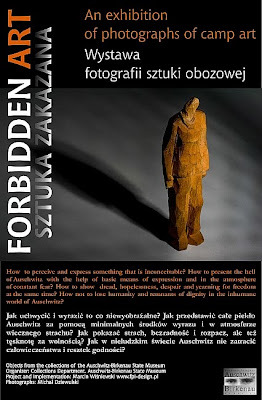 Artists represented in the exhibit include: Peter Edel, Maria Hiszpańska, Franciszek Jaźwiecki, Mieczysław Kościelniak, Halina Ołomucka, Stanisława Panasowa-Stelmaszewska, Marian Ruzamski, Josef Sapcaru, Włodzimierz Siwierski, Zofia Stępień, Józef Szajna, Stanisław Trałka, The anonymous artist with the initials MM, other Aanonymous artists. On the Auschwitz memorial webpage you can also view a gallery of over 90 artworks from the camp and post-liberation period. The exhibit is scheduled to travel. Read more about the exhibtion here. Bar-Ilan University, Israel, September 10–13, 2012. The conference will bring together historians of art and material culture and researchers in history, religions, semiotics, psychology, sociology, and folklore to explore the fields of interest of “Ars Judaica – The Bar-Ilan Journal of Jewish Art” that include, but are not limited to: - The Jewish contribution to the visual arts and culture from antiquity to the present; - Art and architecture of Jewish sacred spaces; - Biblical texts as a source in Christian and Muslim visual arts;- Jerusalem and the Holy Land as an object and model in visual arts;- Images of Jews in visual arts;- Hebrew script in visual arts;- Patrons, collectors and museums of Jewish art;- Jews, arts and politics. Abstracts (limited to 200 words) of twenty-minute presentations with a short CV should be submitted (as attached MSWord documents) by JANUARY 6, 2012 to gr.ajudaica@biu.ac.il. (ISJM) Thousands of foreign tourists visit some of Amsterdam's famous Jewish sites every year, notably the great Esnoga, or Portuguese synagogue (1675). Tens of thousands of Dutch attend the exhibits and events at the Joods Historich Museum, located in a group of historic Ashkenazi synagogues, including the Great Synagogue (1671). 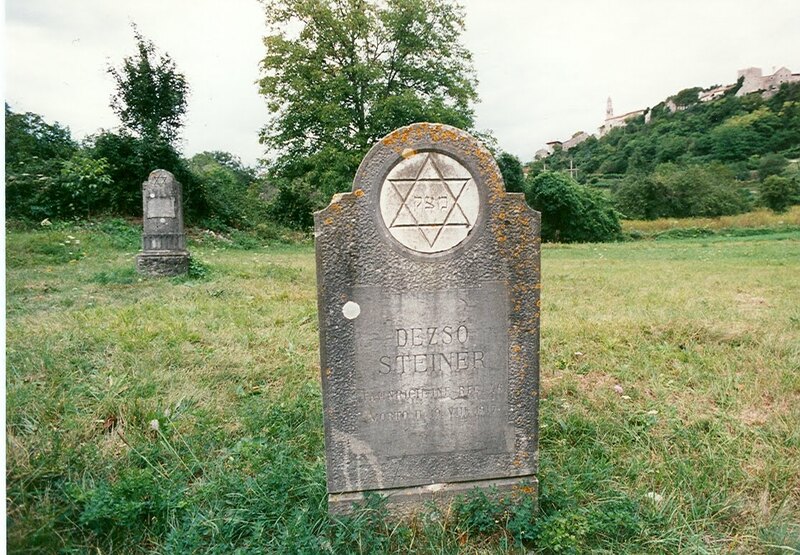 Art historians are familiar with the old Jewish cemetery of Ouderkirk with its many elaborately carved and inscribed gravestones. But few people - within Holland or abroad - are aware of the great Zeeburg cemetery, reputed to be Europe's largest Jewish cemetery, containing between 100,000 and 200,000 graves, and now neglected and in ruin. (click here for photos). According to Jan Stoutenbeek and Paul Vigeveno (Jewish Amsterdam, 2003) the Zeeburg Cemetery was opened in 1714 and because it was in walking distance to Amsterdam it became the resting place of the city's poor Jews who could not afford the contribution to the Jewish Community allowing burial at the Muiderberg Cemetery. By the 20th century, Zeeburg was filled, and a new cemetery at Diemen was consecrated. Zeeburg fell out of use, and the after the the relatives and descendants of the buried there were mostly killed in the Holocaust, and the cemetery was left to fall into disrepair, most recently serving used for paintball games by local teenagers. 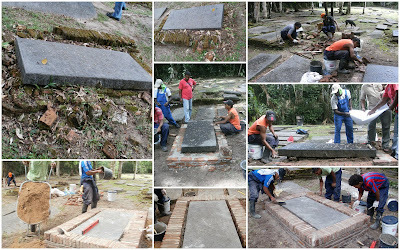 On Sunday, October 30, 2011, Amsterdam’s Stichting Eerherstel Joodse Begraafplaats Zeeburg (Rehabilitation Foundation for Jewish Cemetery Zeeburg) began a collaborative program for Moroccan and Jewish youth to clean the large and neglected Zeeburg Jewish cemetery. On six Sundays, as many as 100 young people will collaborate to improve the condition of the cemetery and in the process to learn more about the history of Jews of Amsterdam. The program to engage young people in the protection of the cemetery was initiated by Frans Stuy and Jaap Meijers who in contacted the Foundation for Rehabilitation Zeeburg. Jaap Meijers said "The cemetery is completely overgrown, it's a jungle. There is a huge wall built around it and making it impossible for regular visitors to visit. We are now looking for the original gate, which is still somewhere, and with the the help of young people, to make it presentable again. Of course we also hope that it will initiate awareness. " For more information on the cemetery and plans for its restoration go to the Foundation webpage.